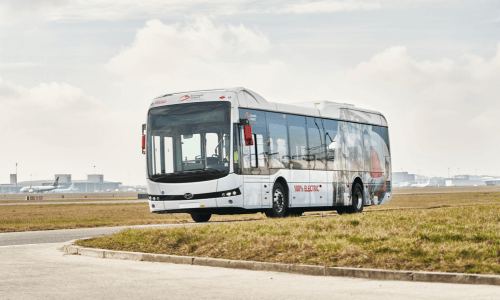 BYD has secured an order for 30 of its 12m ebuses from the Brussels Airport Company (BAC), operator of Zaventem Airport which serves the Belgium capital, and last week saw the first entering service. BYD has entered a 10-year service support contract to ensure the ebuses deliver reliable and consistent service in their role of transferring arriving and departing passengers between aircraft and the terminal buildings. The three-door vehicles are equipped with free WiFi, USB ports for charging and digital displays showing the latest flight information. BYD has supplied 30 of its own-designed charging units to enable the ebuses to be charged overnight at the terminal, similar to the special charging depot already in operation at Amsterdam’s Schiphol Airport, where BYD has had a fleet of 35 of its ebuses running since June 2015. Arnaud Feist, CEO of Brussels Airport Company: “The electric bus project fits in with Brussels Airport’s ambition to drive down its carbon dioxide emissions by 40% by 2030 (compared to 2010). For each equipment purchase decision, we seek out ecological solutions which at the same time offer increased comfort for our passengers.